Welcome to Voice and Bass website! 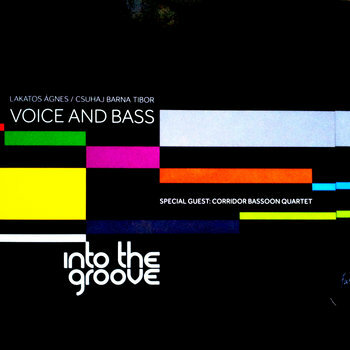 The second duet CD of Ágnes Lakatos and Tibor Csuhaj Barna (‘Voice and bass’) - titled ‘Into the groove’ - is a real curiosity in the world of Jazz. The voice and bass duo is a big challenge for the musicians, requiring a high level of co-operation, technical knowledge, since two intoning instruments – without harmony instrument – from the two edges of the music spectrum composes the music. Even on world level only a few couples tried to record a full CD in this setup. The CD contains mainly own compositions, and also well-known jazz and rock covers. At the end of the CD you can find 3 pieces, which is a result of the fusion with the Corridor Bassoon Quartet, which experiment has created a new sounding and in the near future it can lead to recording a whole CD – written for bassoon quartet.